When I was growing up and went to visit my Grandma – whom we called Nina – she used to have an endless supply of the most amazing freezer jam. She was the kind of Grandma who was always cooking or baking. You would walk into her house and be hit by smells of home cooking – lemon drizzle cake and corned beef and onion pie were amongst my favourite things she used to make in addition to her freezer jam. She always seemed to be cooking and feeding everyone who came to visit. I can’t recall Nina ever referring to a recipe and the recipes she had written down, weren’t very clear and I am exactly the same! I’ll read a recipe and then ‘Beccy-fy’ it to make it healthier and suit my tastes but whilst I’m changing it I normally don’t write down quantities/times etc. I just wing it. 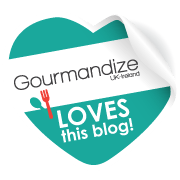 Doing this blog is helping me be more precise but I think it’s great to get into the kitchen, grab some ingredients and see what happens, don’t be scared of the ingredients. Having said that I wouldn’t try to throw things together when it comes to baking…that is a science right there! Anyway I digress, back to jam. This jam reminds me of Nina’s jam and it freezes well too. I had a glut of strawberries which I didn’t want to waste so came up with this recipe. You don’t need a kilo of sugar to go in this jam just a quarter cup of honey and yet it’s still sweet. You can add more honey if you prefer a sweeter jam but I don’t like food to be overly sweet and the strawberries I had were already lovely and sweet. 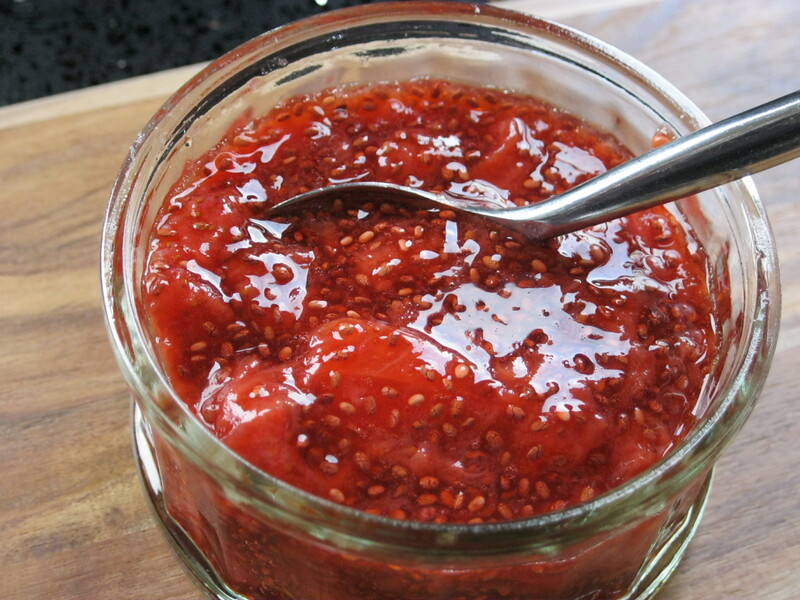 The chia seeds, which are a powerhouse of goodness, help thicken the jam as they absorb liquid. Chia seeds, if you are not familiar with them, have been dubbed a superfood, and it’s easy to see why. 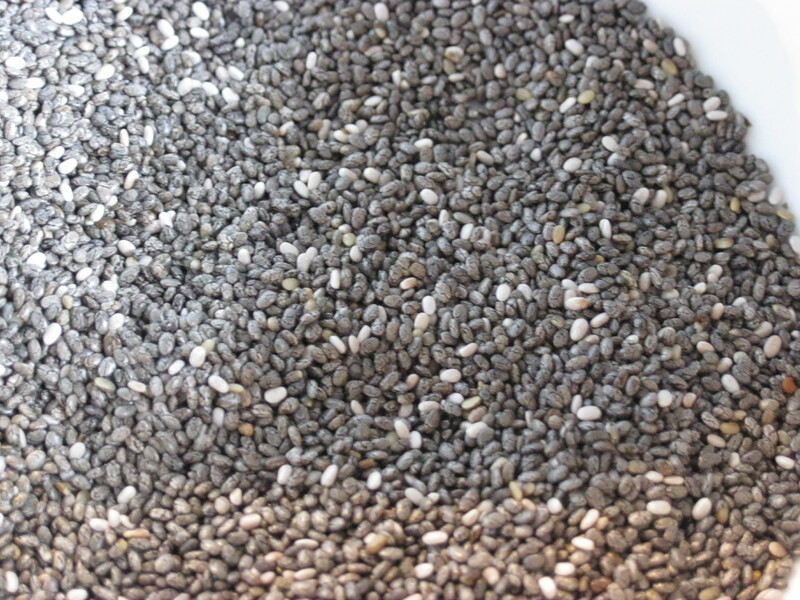 Chia seeds contain a wealth of antioxidants, high in dietary fibre and complete proteins. You can have them sprinkled over porridge or in a smoothie. If you’re not too keen on the texture of them in a dish, like this jam for instance, you could grind them up into a powder, I don’t mind the texture so left them whole. Place the strawberries and honey in a large pan over a low heat. Stir well to coat the strawberries with the honey. Cover the pan with a lid and allow to cook over a low heat for 20 minutes, stirring occasionally. 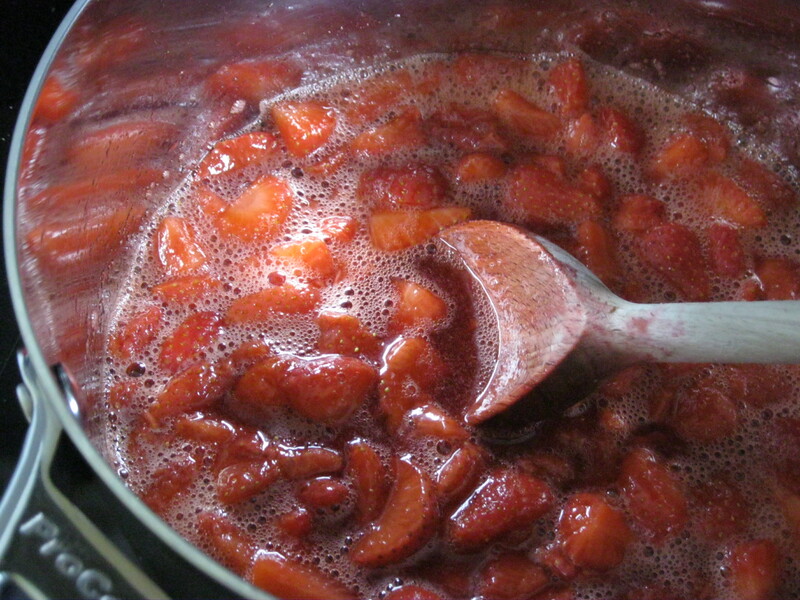 After 20 minutes, the fruit will be soft to mash gently with a wooden spoon – depending on how you like your jam is how much to mash. Put the lid back on the pan and cook for a further 10 minutes over a low heat. Add the chia seeds and stir well until combined. Cook for a further 5 minutes. If you’d prefer your jam to be a thicker consistency, add another tablespoon of chia seeds. If you prefer a sweeter jam add some more honey. Place jam in airtight containers and freeze or keep in the fridge.